Pretty certain it's never had a mention in the strip. Thanks Sector Chief - Seattle gets removed. I've banged on about this before, but I really like the way that Dredd's world - even after all these years - still has a sense of mystery about it. I like the ambiguity - like for instance that much of the European continent has never really been mentioned in any detail. Even the geography of mc1 itself has never been locked down. It allows the writers to throw in new buildings/landmarks or even whole cities or nations as and when without contradicting what has previously been set in stone. I always felt that the idea that each major city would become a mega city with its own identikit judge system was a bit of a mistake - and it's something that John Wagner has seemed to conciously play down over the years. Don't mean to piss on anyone's chips though - the map is a fun little project. Kritocracy - government ruled by Judges. Me too. I thought it was a missed oppurtunity in the Megazine to play around with this notion. Instead of it being Dredd and his international pen-pals with funny hats and helmets, I think it would've been a lot more interesting to have different types of state/political systems and erstwhile territories adopting alternative diciplines for rule, or no rule, as the case maybe. It's fine having a few of the big-knobs of the old world like Brit-Cit and the Sovs having Judge-Systems but think of the possibilites of other city-states round the world run by technocrats, theocrats, plutocrats, geniocrats, robocrats, sortition lotteries, caste systems or even, Grud-forbid, vanilla democracies. Having characters from the Meg interacting with these other peoples/places has more potential instead of Dredd just meeting his Judge equivalent in the relevant town. I mean Ireland having Judges! Feck-off. I always found it strange that the city with the most sci-fi sounding name, "Uranium City", is actually a real place. Got another one in Europe for you. Ruhr Conurb, mentioned in Midnight Surfer. Similarly to the Seattle thing, though... Was Chicago already on the map or can somebody kindly point me in the direction of a Dredd story involving the Windy City? Posted from the Work Wastes. That map's from a Judge Anderson story. I suspect, like many other maps featured in 2000 AD, it's got its contradictions. On Seattle, however, my reading was that it's simply flagging a place that is, for whatever reason, a 'site of special interest'—all the population centres (i.e. 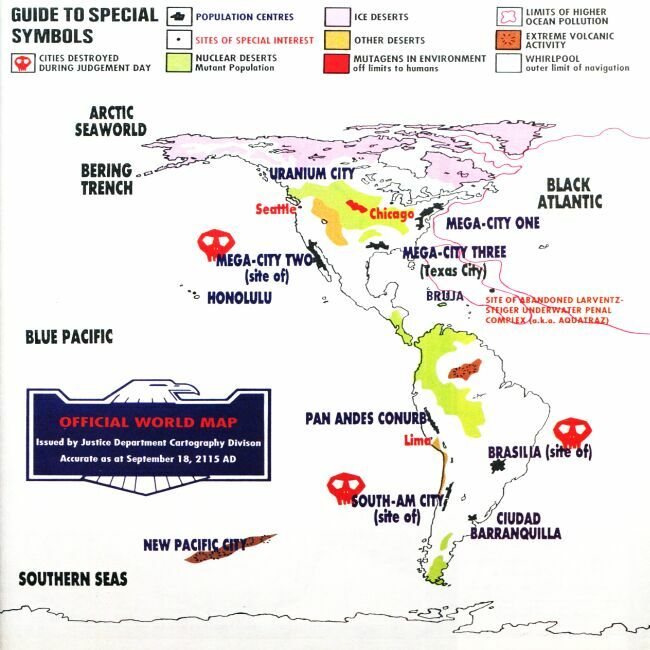 cities) on that map are in uppercase purple type. The name's red (like Chicago), so I assume its covered by the 'Mutagens in Environment' key. So maybe its a mutant haven or something? Its possible though technically not cannon as it hasnt been mentioned. I was just marking it up as a Great Germ War reference in the case of Chicago, though I also suspected that it may be the case that some aborted storyline was being referenced in the map. Oh... and I got to thinking about Mega-City Two for the map. Left as nuked out or one bit back/rebuilt and most still nuked out, to reconcile the local storylines since Judgement Day? I don't see an insoluble contradiction between those stories that have shown the city post-Judgement Day myself. After all, it's a sodding massive slab of land so it wouldn't have been entirely reclaimed. You might think it a bit of a fudge, perhaps, but it's still a fair fit. Love the Map, one thing that has always left me wondering, why is the whole world radiated in Dredds world? I could understand parts getting hit in a war, but why is the whole globe? Yeah, I know madman and all that, but its one of the few bits that just dosent work for me. I could understand the States, Europe and most of Asia, but New Zealand, come on, its a nice place! It's also in the way of Russia and the USA.